I live in a small village sweetly named ‘Tiptoe’, which is in ‘The New Forest’, Southern England, UK. The New Forest is quite an exceptional place, as horses owned by Foresters, roam wild in 1000’s of acres of beautiful countryside. If you ride, then it is a uniquely free place to roam, any horse owners dream! Highly recommended for horsey holidays. What lead you to painting? I grew up in Bournemouth, a coastal town in southern UK and moved to The New Forest after I met my husband. We live on a smallholding with our 2 children, Harry 20 and Frankie 18, who both ride. We have our own horses two of which are ex racing stock and my son uses them to do the ‘round ups’ (also called ‘Drifting’) of the horses on the Forest. I have done so many things in my life; my friends tell me I should write a book. But In short, my passions were music and art. I played the guitar, wrote music and sang in front of a few audiences and on the local radio station. I studied art at school and College, but as my mother was a hairdresser I took it up as a profession, and owned my own salons. I also loved dancing and danced with a troop of girls around Europe for a year in the 70’s. After which I came home to continue with hairdressing, as well as running a successful nightclub, which as you can imagine was exhausting! If I had any free time I would sit down and paint, or go on a painting course or holiday. When I was expecting my son I had a craving, not for weird food but to start painting again! I did, and settled down to the one true profession I had always wanted to pursue, and now since the children no longer need me to fulfill their every whim, I am painting full time…, which is wonderful! I have a passion for anything with fur or feathers especially if it needs rescuing. I have numerous animals including 6 dogs, a fat rat called ‘Pickles’, an Albino ferret, a crippled chicken that my daughter rescued as a chick, and 12 years on lays eggs and has a good life. And then of course there is my beloved African Grey parrot, inspiringly named ‘Parrot’, who lives in a large aviary in my studio and keeps me amused by his amazing grasp of the English language albeit sometimes a little strong…I blame my son for that! We have also kept pigs, sheep, and many different types of poultry including Turkeys that should have ended up on our Christmas table, but mysteriously disappeared, and ended up on a children’s farm! You paint more than just horses, what is your favorite subject? I have always loved painting animals, but it wasn’t until my family bought horses that I became aware of their beautiful forms. When they have been ridden hard and the sun shines on their sweat soaked muscles they have to be the most stunningly beautiful animals in the world. So obviously I became hooked on painting them. I now paint commissions of Horses, Pets, Children’s portraits, Public House signs, Trompe L’oeil (trick of the eye) and also still life, which includes many subjects, from china to guns. Although horses have to be my preferred subject, I do love painting children, especially when it is not a posed picture, I love to see them laughing and playing, it makes for a more natural and interesting painting. I paint mainly from photos, but only if the composition is right, with plenty of fun and color. I am obviously a huge fan of the 18th century British Equine artist George Stubbs. If some of your readers haven’t heard of him please check him out, as he was incredibly talented at capturing the movement and beauty of the horse. Another favorite is, animal artist Thomas Sydney Cooper, who mainly painted cows and sheep in the English countryside, superbly. I was lucky enough to come across one of his paintings for sale at a local auction and just had to have it! To my husbands dismay as it cost an arm and a leg! My other all time favorite will always be the English landscape artist John Constable, he holds such a dear place in my heart, as I am again fortunate enough to own 2 of his drawings, a gift from my father. You work with a variety of mediums, which one is your favorite? Although I work with Acrylics and oils my favorite medium has to be pastels and in particular Panpastels, a reasonably new American invention, which provides such rich vibrant colors, and the ‘sofft tools’ they come with help to loosen up my work a little. If any of your readers have dabbled with pastels, they should give these a try. This company has also featured a few of my paintings on their gallery page. Do you have any secret rituals you do to help you get in the zone for your art, and how do you start a painting? As I work mainly in pastel, which has to be the messiest medium, I have a good clean up and de-dust first. I put BBC radio 2 on, and then get into my parrots aviary with him to have a kiss, cuddle and bop to the music. I am then ready for a good few hours work. After the initial sketch, and getting the proportions and perspective correct, I have to start with the eyes, as they show the whole character of the subject. I move on to get the darkest and lightest tones down, and at this point I generally have the feeling of the picture… then it becomes exciting. It’s a strange thing, but I always have to know the name of the person or animal I am painting, it’s only then, that it becomes personal to me. I really enjoy going to Polo matches locally and watching those amazing horses twisting and turning and of course the handsome riders. I can’t wait to get home to start painting! I combine my portraiture with animal painting to achieve the likeness of both horse and rider. Do you have a favorite painting? I have 2 paintings, which I have a special fondness for; ‘Rio’ was a horse that my daughter had for a while, he was a 16.2 hand Dutch Warmblood, a magnificent animal that I just had to reproduce on canvas. 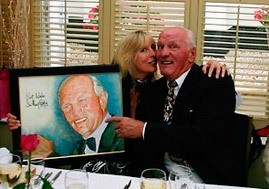 The other, is one of the first portraits I did, its of the British boxer Sir Henry Cooper who famously fought Cassius Clay aka Mohammad Ali. He came to my fathers 80th birthday party as my Dad used to be a pro boxer, and the same generation of fighters as Cooper. I spent 2 amazing hours with him and he signed the portrait as a gift for my father, and as you see in the photo we got on very well, a few glasses of wine helped! What effect do you think the Internet will have on art and has it had an effect on yours? The Internet is such an incredible shop window and educator, which is right there in your own home. Although it definitely has cons, the pros are just endless. People who are into any aspect of art are able to look up any known artist to peruse their work. For a working artist like myself, who, pre-Internet had to rely on word of mouth or advertising for commissions. I now have a web site, which is providing me with a new source of clientele. Also for anyone wanting to take up art, and is looking for inspiration, but finds that books and DVD’s on the subject are expensive, there are a number of sites such as youtube where artists using all mediums have posted short films of tutorials, which are free to watch. 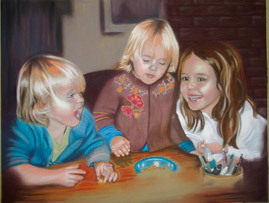 At the moment I am finishing a portrait of 3 beautiful children, the composition is an artists dream, and not only are the kiddies gorgeous, but it is proving to be a fun painting to do. I am also in the middle of painting one of the Queens Horse Guards in Acrylic, which I need to finish soon as possible as I will be entering it for the annual Equine Artists Society exhibition at The Mall galleries in London… fingers crossed! Then I have to really buckle down to produce at least 12 paintings for a shop window, which is showcasing my work in April.